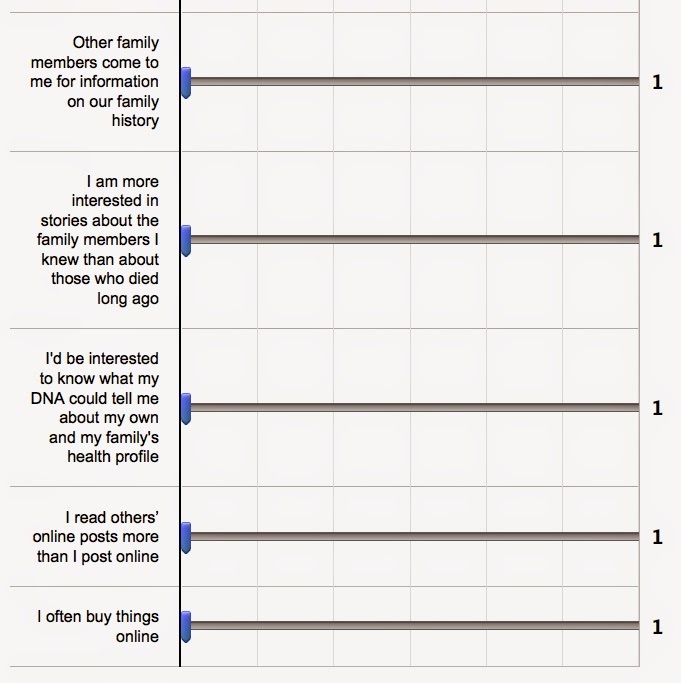 Just as in genealogical research, DNA is of little value without a paper trail. 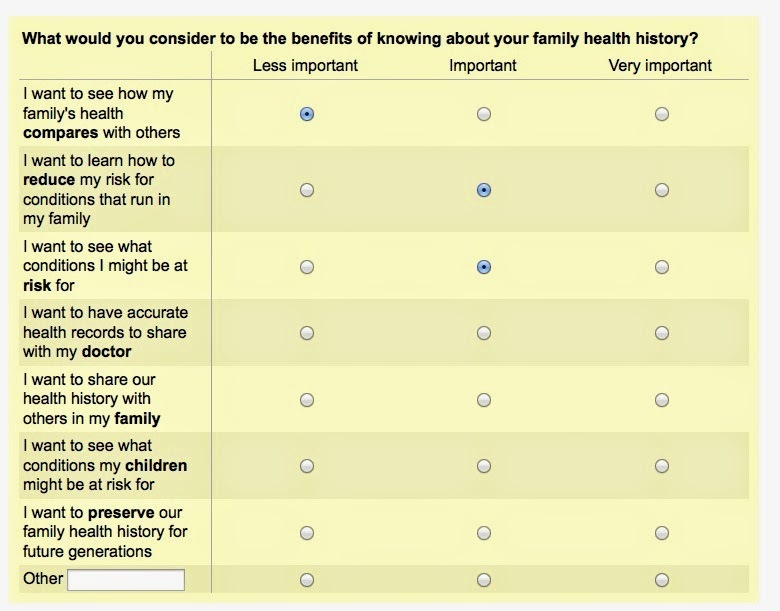 Significant value and power lies in combining detailed family health histories with genetic data. In my opinion, 23andMe has missed a significant opportunity to link family histories with genetic data and make ground-breaking discoveries. 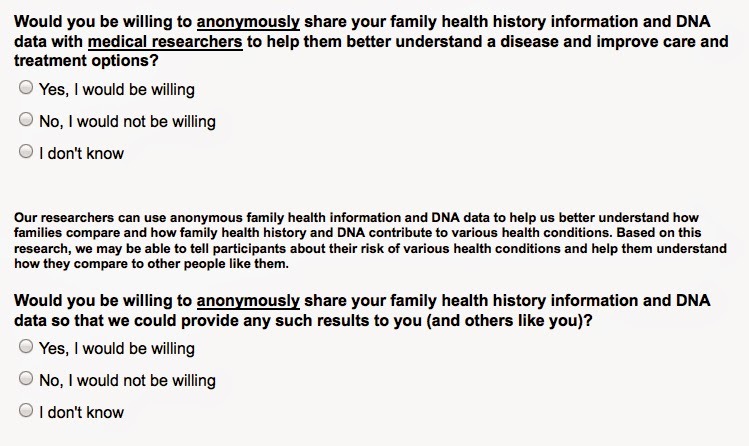 From this survey, it appears that Ancestry.com/AncestryDNA recognizes the value of this information and that they may be considering getting into the business of supplying their customers with heath related information the way 23andMe did prior to November 2013. It would appear that they are constructing a database very similar to the Utah Population Database with SNP data generated from the Illumina Chip they currently use. 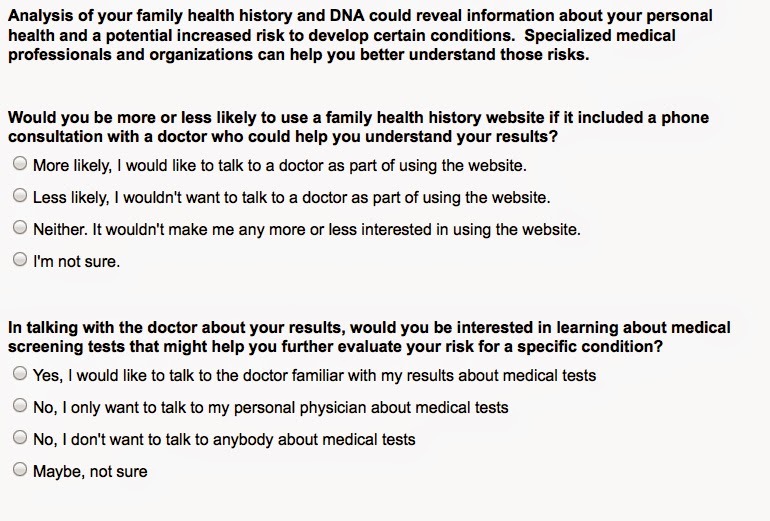 Will AncestryDNA now be subject to the same FDA guidelines that are currently prohibiting health information from 23andMe, and if so, will Ancestry join the effort with 23andMe to allow this type of information to be provided to consumers? 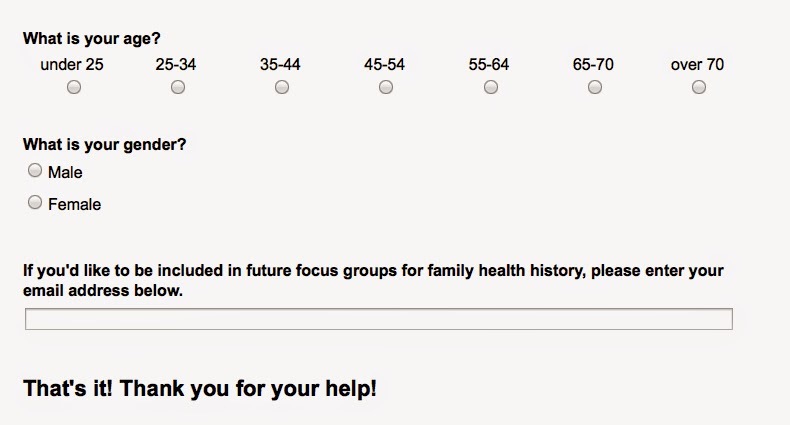 Or, will they ride 23andMe's coat-tails into the health side of the personal genomics market? 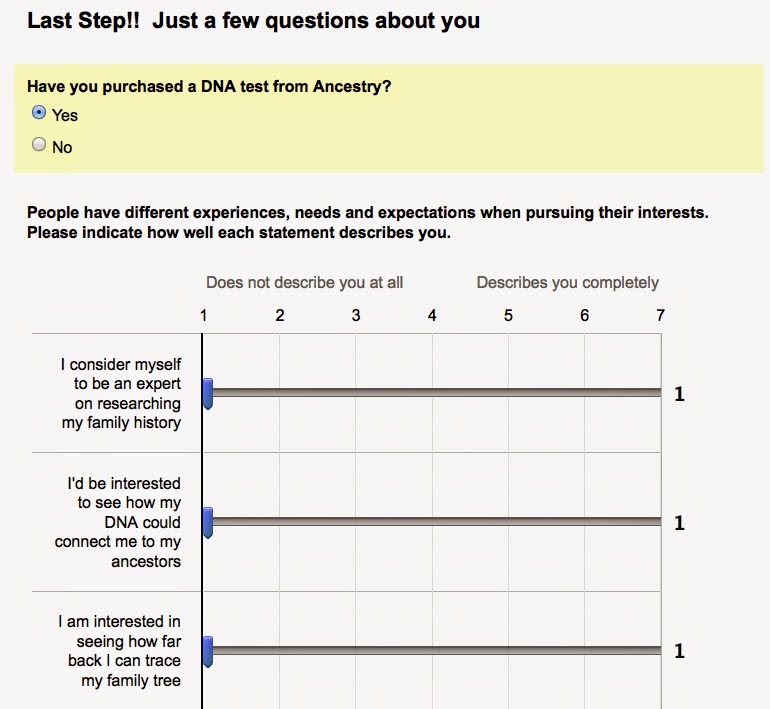 Will Ancestry re-sell this data to large pharmaceutical companies? 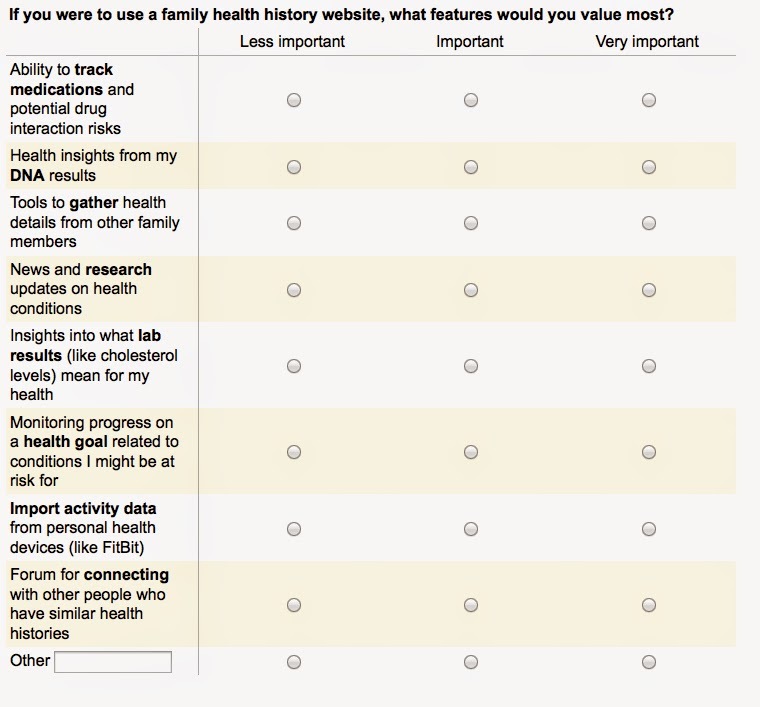 How can we participate in this research, and should we as customers be participating? There are many other questions I could ask, and in the end, I do believe that health care needs a serious overhaul and the revolution that Anne Wojcicki started with 23andMe cannot be stopped now. I believe one of the best ways to revolutionize health care is to understand what our individual genetic code is telling us about future disease risk, how to manage that risk and prevent disease if possible. 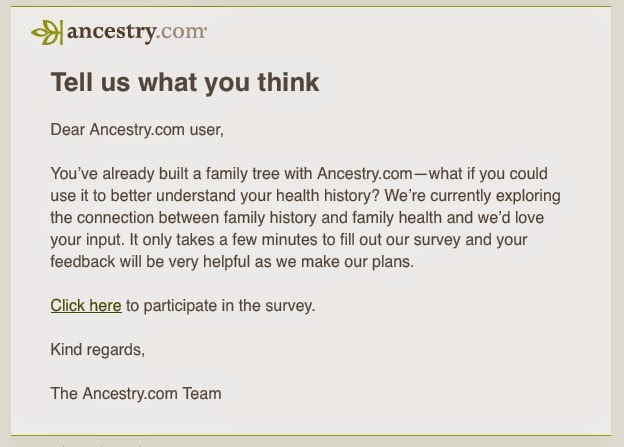 It appears from the questions on the Ancestry survey, that they recognize the power of this information as well, and that they plan to move into the space currently occupied only by 23andMe. Thanks to Angie for sharing this update and important information with my readers! This is truly a unique opportunity to personally meet with - and learn from - some of the world's leading Genetic Genealogy experts who, for the first time ever, will appear under ONE roof at the first International Genetic Genealogy Conference scheduled for Friday, August 15th through August 17th. The fabulous Judy Russell, Julie Granka, Greg Magoon, William Howard and Razib Khan were all added to the schedule since I last wrote about the conference.